Tattoos in memory of FDNY are an example of the rich history, traditions, and respect for the FDNY. These memorial firefighter tattoos are worn by people all over the world. Tattoos are a way for them to express the profound grief felt from the losses related to 9-11. The tattoos also create a sense of connection to one another, and help to assuage the sense of helplessness felt by so many firefighters in the face of profound devastation. The Fire Department City of New York is responsible for an area of 320 square miles which contains over 8 million people. The FDNY is an army unto itself with over 11,400 fire officers and firefighters, 2,800 Emergency Medical Technicians, paramedics and EMS supervisors, and 1200 civilian employees. The FDNY is a large organization of courageous people dedicated to serving the public by keeping them safe from loss of life and property. The tattoos in memory of FDNY illustrate the respect and reverence felt for this fire department and firefighters everywhere. The family of firefighters is rich in tradition and lore. The tattoos they wear in memory of fire departments, family members, fallen comrades, and dates that changed their lives tell the story of what it means to live a life of service to public safety. The skin art is an illustration of the pain and the pride that is felt by the firefighter who bears the tattoo. Each tattoo is unique and has its own story to tell, but there are also common themes and characters found among the designs. Knowing the meaning and history of these universal symbols creates a better understanding of what a firefighter memorial tattoo is expressing. St. Florian is the Patron Saint of Firefighters. He was an officer in the Roman Army and a devout Christian under the Emperor Diocletian. The emperor was not pleased with Florian's beliefs and ordered him to go to a village and punish all Christians by burning the churches and books, persecuting and killing them. Florian stayed true to his beliefs and refused to carry out these acts. He was sentenced to death by fire. As he stood before his funeral pyre, he told the Romans to light it and he would climb to heaven on the flames. He was tortured and drowned in the River Enns. Because of the courage of his convictions and his resistance to being killed by fire, he is the patron saint of firefighters. This St Florian tattoo image is on the upper arm of Roger Hall, a full time New Hampshire firefighter. It was inked by Anil Gupta. 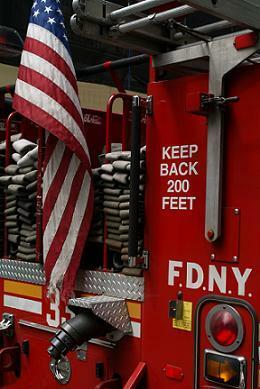 There are three numbers often seen in FDNY memorial tattoos-343. 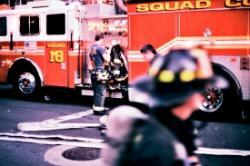 This is the number of firefighters that perished on September 11, 2001. Firefighters bear this number as a reminder of the profound loss to the world when these brave people paid the ultimate price to save the lives of others. Firefighter Mike Johansson of Nashua, NH bears this 343 tattoo shown in the picture, inked by Chris at Sanctuary Tattoo in Portland, Maine. When a firefighter faces so many life threatening circumstances and lives to fight another day, it is hard to argue that there are no guardian angels. Angels can be seen among the flames and offering solace in many FDNY memorial tattoos. Mike Golding, a thirteen year veteran of the FDNY bears this large back piece shown here that depicts the presence of guardian angels around a weary firefighter. This symbol is seen worldwide on fire service trucks, badges, and signage. This cross was originally the Cross of Calvary. It was worn to identify The Knights of St. John from the island of Malta. The foes of these knights often attacked with fire, and The Knights of St. John would fight the fires to save the lives and property of those they protected. Because of their bravery and skilled fire fighting, this cross became a symbol for modern fire service. Artie, who works at engine 229 FDNY, bears a 9-11 FDNY memorial tattoo featuring a Maltese Cross. It was inked by Dana at Tattoo Lou's in Huntington, NY. Tattoos in honor of friends and family members are some of the most moving. The family of Brian Cannizzaro all bear tattoos in his memory. Anthony DeRubbio carries a permanent portrait of his brother David DeRubbio, Engine 226. Anthony and David were both FDNY firefighters in 2001. David perished in the South Tower on 9-11. This beautiful likeness was inked by Ron and Dave's Tattoo of Long Island.